This chapter is a lengthy introduction to the general theory of discrete-time martingales, biased towards the needs of the subsequent chapters. 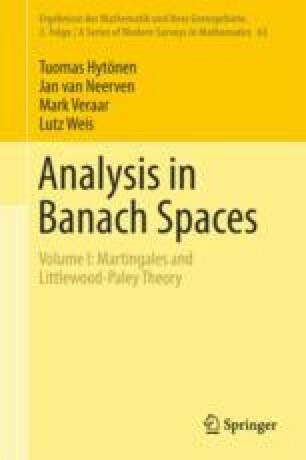 Throughout, we discuss martingales with a σ-finite measure space domain and a Banach space range, but the development is self-contained and does not assume any results from the conventional set-up of a probability space domain and/or a real-valued range. Each section is devoted to a different aspect of the martingale theory, including norm inequalities, convergence results, decompositions and transforms, and norm approximation of general martingales by simpler ones. This systematic development of the general martingale theory will substantially streamline the discussion of UMD spaces in the subsequent chapter.